I was out for a group lunch on the weekend and ended up sitting across from someone I didn’t know. When our food arrived, she just happened to mention that after dieting for a short time, the only thing that she sees (or thinks about) when she looks at a food, are the number of points or syns that it contains. She felt she had a really distorted view of food now and needed some type of “deprogramming.” The reason she went on the diet in the first place was to resolve some health issues. While that part was successful, she is now dealing with the long-term consequences of how that dieting has affected her mindset and her relationship with food. She even found it difficult to work with a nutritionist in the past re: being vegetarian, because the types of food the nutritionist was recommending were ones that she felt uncomfortable eating because of the number of points or syns they contained. So my question to you this week is…how has your history of dieting affected your perception of food? And how is this affecting your nutritional intake and your quality of life? I don’t have a problem with nuts, cheese or avocado. While I recognise these foods are higher in calories, they are also highly effective at helping people keep full for longer and preventing huge swings in blood sugar levels. Sometimes you need to weigh up these competing factors. There is far more to food than just calories, fat grams or grams of carbohydrates. Sadly, diets (by their very nature) take a very narrow, black-and-white approach to food. They are ultimately trying to get you to eat less, sometimes accomplishing this in creative and often bizarre ways. For example, some diets will tell you to give up carbs. 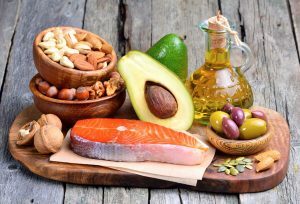 Others will tell you to stop eating high-fat foods. Some will tell you to limit the number of hours you eat each day. Still others will tell you to severely limit your calorie intake for at least 2 days per week. They all ultimately get you to eat less (at least in the short term). But who is paying attention to how well you are nourishing your body in amongst all of this? And who is dealing with how you think about food or any binge eating which occurs as a result of depriving yourself? In reality, there are no “good” or “bad” foods and there is no one “perfect” way to eat. All foods have great things about them and no-so-great things about them. Besides, people eat for many different reasons. Sometimes you will choose a food because it tastes good. Other times you will choose a food because that is the only thing available. Sometimes, you will be aware that your body just needs more nourishment and you will provide it with foods to meet that need as well. I find it interesting when people tell me they just don’t want to think about food. They are usually so tired and confused and sometimes…they believe they can’t trust themselves anymore, so they just want to hand over the power and responsibility to someone else. But do you really want to hand over that responsibility to bloggers, authors or slimming clubs who don’t know anything about you and who put weight loss ahead of your health? You can implement Intuitive Eating, where you start paying a lot more attention to how different foods make your body feel. At the end of the day, a professional can only give you the “textbook” answer for how different foods are expected to affect you. Ultimately, you need to “test drive” any information to find out how your body responds to different foods, forms of physical activity, sleep and stress. The wisdom is there…you can tap into it at any time…but most people are so busy running in a million different directions that they don’t stop to notice the wealth of information their body is giving them…right…now. Just stop for a minute. Breathe. Notice how you are feeling. And then you will know what to do. If I can help, please get in touch at info@eatgreatfeelgreat.co.uk or sign up for my bi-weekly newsletter at http://eepurl.com/dxu6rT.